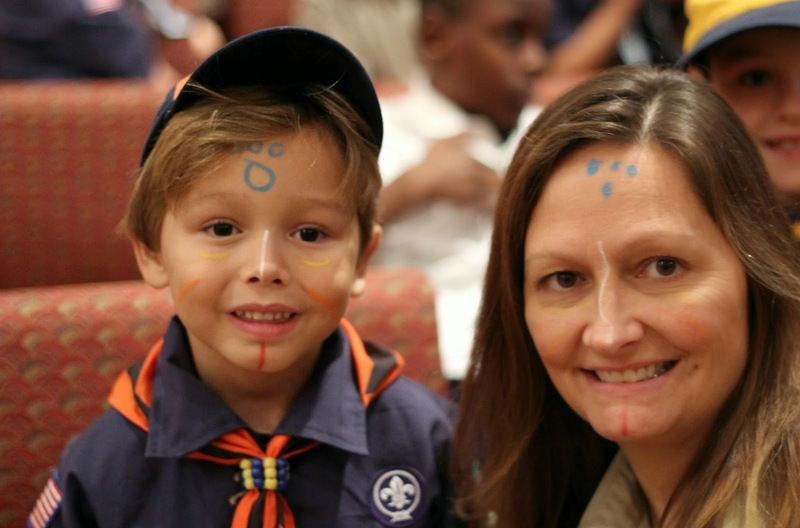 Our Cub Scout Pack began the new school year with a Family Orientation meeting, to help the new folks feel more at home and to clarify a few details for the "older" families. Midway through the meeting the scouts and their den leaders were excused to meet up in their dens while the meeting continued, because they honestly, truly, 110% couldn't care less about the business and financial stuff of the pack. I wanted the newer boys to meet all the kids in their den and to get a chance to meet their den leaders, to see what the pack was like. I also wanted them to make something ... keeping their hands busy would help them feel less nervous and less crazy active, and having something to take home would help them feel a bond with the pack. The challenge lay in finding a craft that would work for six year olds, but also work for 10 year olds, would take about 15-20 minutes, wouldn't be super expensive, and would be something they'd like to have. After much Pinterest and Google searching I found a pony bead alligator. We're in Florida, so that's cool, but no way was that easy enough or quick enough. The bead alligator led to think of making a keychain, a much simpler alternative that the boys could actually use if they wanted to. 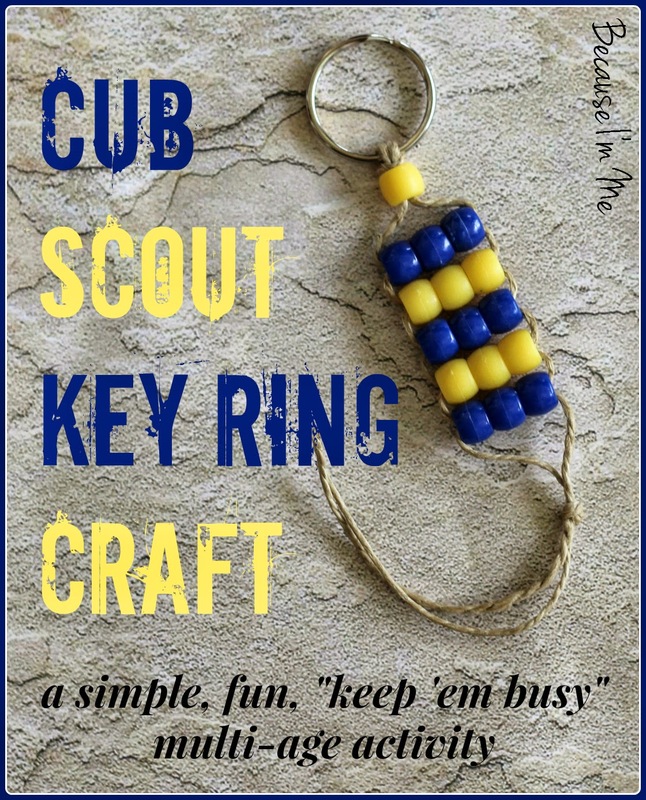 I opted for cobalt blue and yellow/gold pony beads because they are colors that symbolize Cub Scouting. Each of our dens contain about 8-12 boys and we had no idea how many new or visiting boys and siblings would want to participate. All in all, these seemed like a daunting task for a den leader to teach solo. I was lucky enough to enlist the help of our Boy Scout troop (who also spoke to the boys about Boy Scouting early in the Family Orientation meeting), almost all of the troop came and helped, which made an awesome impression on the boys and their families and led to a few older siblings joining Boy Scouts. The Boy Scouts were divided among the dens, with the oldest scouts working with the Webelos dens. And then the crafting began. This was the moment I learned of my big error. Not enough people had an idea of how the craft worked, in fact, I'd only showed two of the Boy Scouts. What I thought was self-explanatory wasn't in the time allotted. Fortunately, those two Boy Scouts and I were able to quickly teach the rest of the Boy Scouts and the den leaders. Totally my fault. Most of the boys were able to finish their key rings before the end of the meeting and seemed to like them. Clean up was super easy, as it was just picking up a few stray beads. I filled Ziploc bags, each with enough beads, 3' long sections of jute, and key rings for 15 boys as well as a sample completed key ring. Each Ziploc bag was placed on a separate table, with a sign for which den was meeting at that table. Attach center of jute to key ring using a Lark's Head knot (create a loop in the center of the jute, wrap the loop around the key ring, run the two strands through it and tighten). Slide one bead onto both strands of jute and bring that bead up to the top. Slide three beads onto one strand of jute. Run the other strand of jute through the same three beads, starting at the opposite end of the first strand. Repeat the last step four more times, tightening the jute as you add each row of beads. Don't worry if it won't lay flat, we got our wet at the end and it fixed it perfectly. Also, if the jute isn't perfectly tight don't worry, you'll be able to tighten it more in a second. Add one more bead onto both strands at the same time, in the same way the first bead was added. Tighten the jute throughout the key ring as much as you can and tie an overhand knot using both strands of jute. If your overhand knot doesn't hold the last bead on tie another on top of the first. That's it! Enjoy your key ring. Of course, this isn't exclusively a Cub Scout craft, change the colors and have fun! River lost his neckerchief slide at that pack meeting so I took his key ring apart and made him a ring neckerchief slide out of it. Works great.